Bright lights, big city, and an outdoor patio? Huge dudes, heavy iron, and equipment galore? This place has it all! As long as there are people with the drive and determination to get in shape, they will need a place to do work. As long as those places exist, we will work to shine some light on the good work done within their walls. Inspired by the success of the Metroflex Gym in Arlington, Texas (a previous Gym of the Month), Greg McCoy started his own version with the same successful formula in Plano. Now watch as this location grows and increases its impact on the fit community in the Dallas Metroplex area. We congratulate Greg and his exemplary crew as this month's gym of the month! Friday-Saturday - 7 a.m.-10 p.m.
Sunday - 7 a.m.-8 p.m.
How did the gym start and why did you decide to begin in the gym business? 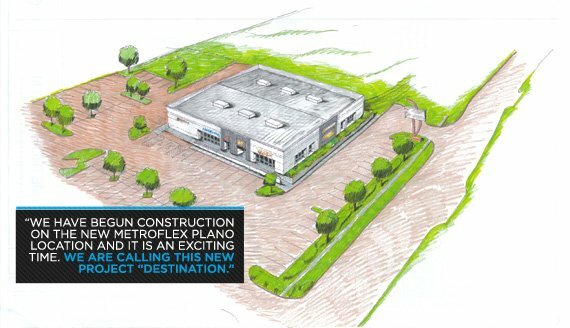 Metroflex Plano started as the first expansion of the Original Metroflex in Arlington. I trained in Arlington as a teenage competitive bodybuilder and loved the atmosphere the gym had to offer. I was finishing up my degree at Oklahoma State with the intention of opening a personal training studio when I finished school. I began talking to Brian [Dobson, owner of Metroflex Arlington] about the idea of opening a second Metroflex. I had the advantage of using my business plan through my last year of college, having professors weigh in on my ideas, and Metroflex became the subject of a few class projects. I want to be successful at what I love doing. I love training, I love helping people, I love perseverance in athletics and business, I love entrepreneurship and I love being around the positive fitness community; it's not work when you love what you do, and that's why I am in the gym business. Can you give us a description of what went into opening your awesome establishment? I started Metroflex Plano on a shoestring budget. I was blessed to find an equipment deal that could fill out my newly-rented space. While the price of used fitness equipment is high, I was able to find a killer deal that made my dream a reality. In the beginning I had little to no help. There was no team yet. I would work from open to close, seven days per week, and didn't even smell profit in the first 15 months. My Dad would drive from an hour away five days each week and help me in the morning with bookkeeping, cleaning, running errands, and freeing up my time so I could train clients to bring in extra revenue. It was one of the hardest-working periods of my life, but I'm proud that the gym was able to succeed in a terrible economy to serve a niche that most people deem unprofitable. Are you planning on expanding? Yes! We have begun construction on the new Metroflex Plano location and it is an exciting time. We are calling this new project "Destination". Under the same roof with Destination will be global-leading fitness clothing brands Gasp and Better Bodies—which have a showroom and warehouse—sports nutrition retailer Ultimate Sports Nutrition and, of course, Metroflex Gym! Destination will truly be a must-see location for fitness enthusiasts worldwide. We will be focused on providing not only a great gym, great clothes, and great supplements, but the entire fitness package: photo shoots, training camps, pro seminars, power meets, industry events, and more. The location will be triple the size of our current facility and is being built from the ground up for the purpose of serving those who live the fitness lifestyle day in and day out. The buzz around the new location is incredible. We had a groundbreaking and barbecue in August to invite out the iron community, and the turnout was incredible. Branch Warren and Johnnie Jackson train in Arlington and are excited about Destination, so they came out to support Gasp and Metroflex and this new location. Flex Lewis also came to town for the event with his lovely girlfriend Ali Rosen. Legend Rich Gaspari came by to grab some barbecue, as well as Zack Khan and Larissa Reis. Of course Plano resident and Metroflex member Steve Kuclo was there to celebrate, as was my favorite superstar (and girlfriend) Tawna Eubanks. We had more than 300 people there to see the groundbreaking ceremony. The buzz is incredible, and this place will be a destination everyone needs to visit! The building will be more than three times the size of our current location. Along with collaboration with Gasp/Better Bodies and USN, we will have a lot of needed upgrades from our current facility. As far as Metroflex is concerned, we will be expanding our hours because we are adding showers to better take care of the early morning fitness crowd. We will also have an expanded cardio room for all our pre-contest athletes to enjoy, as well as a room for posing lessons and classes, which are a big part of creating great athletes. We are moving all our current equipment over and adding to the collection, especially expanding in our power sports areas that we just simply don't have room for now. It takes specific equipment to be the best in power sports these days, and this facility is for athletes who want to be the best. We work hard to meet their needs. Knowledge, atmosphere, equipment, and community. I list knowledge first because it truly sets us apart. We have real top-level athletes who know how to be the best in their respective sports. This has a great trickle-down effect, not only for aspiring athletes but also for everyday clients who want to drop pounds or put on a little muscle. What better way to do it than to be surrounded by supportive "walk the walk" kind of people? A key part to this equation is the dedication to continue learning. All our trainers have worked and continue to work with top gurus around the world, as well as us bringing in industry knowledge for seminars and hands on learning. It keeps everyone sharp and improving. 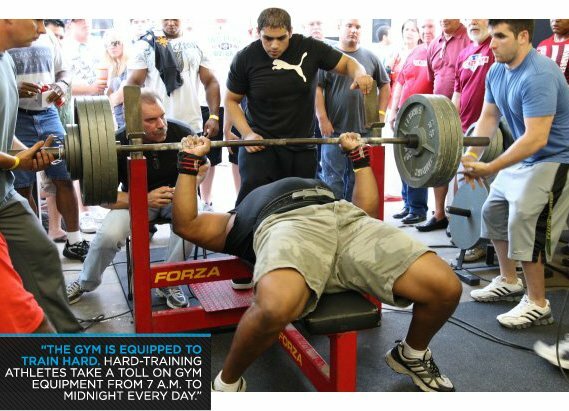 Metroflex Plano offers a serious training atmosphere that's simply hard to find. This is what I wanted to capture from Metroflex Arlington and Brian Dobson. You can feel the electricity when you walk in the gym. Something in the air just makes you want to push harder. The music is pumping and the weights are iron, so they make a clanking music all their own. Members are tight-knit and holler words of encouragement across the gym, and the energy of hard-training people around you is infectious. This atmosphere alone will raise your game. The gym is equipped to train hard. Hard-training athletes take a toll on gym equipment from 7 a.m. to midnight every day. If it's not tough stuff, it's not going to last. When I first opened, I bought four or five chrome-plated bars, like you'd find at a commercial gym. You should see those things now! We keep them just for fun, but they are all bent in a pretty serious U-shape! We have all the staples you need for just about any bodybuilding routine, and a few of the cornerstone pieces to accommodate the stronger than average user. The leg press we have will hold up to 18 plates per side, and most of the plate-loaded equipment is Hammer Strength, so you can go heavy and the machine can handle it. We also have some harder-to-find stuff like a donkey calf raise, a vertical leg press, a reverse hyperextension, a glute ham raise, sleds, prowlers, a run-rocket, atlas stones, log presses, battle ropes, mono lift, farmer's walks, tires from 100-700 pounds, and a few other toys. It's not uncommon for members to build stuff for us either which is pretty cool, for example one of the more popular handles for the cable station was made by a member who works for an aerospace company. He made a handle out of the same material they use to build fighter jets. The sense of community is a big difference maker too. At any commercial gym I've ever trained at you never really know anybody or their story. You may recognize a few faces, but if you're like me you just end up making nicknames for all the usual suspects and that's about it. Fanny Pack guy, Over-grunter, Smelly, things like that. Here we have a true community of athletes. People know one another, support one another and motivate one another. It's not uncommon for a big group of members to follow one athlete to a competition to rally them on. When you have members who witness each other training intensely day-in and day-out, they really enjoy seeing the blood, sweat and tears turn into victory. There are also not a lot of places where you can walk in and end up training beside such high-profile athletes. We have a great group of trainers. As a whole, our training team is great because it offers a wide variety of expertise. Whether you are training for bodybuilding, football, or motocross, chances are we have a trainer that has experience training someone at a high level in your field. A few key things set them apart from other trainers at other gyms: their knowledge, experience, and accessibility. As I said earlier, knowledge is big for us and this training team has a lot of it. We also invest in keeping everyone learning. This team also has experience. Most of the team here trains because they are athletes themselves and enjoy helping people. You aren't going to get a guy who has never seen a bodybuilding show trying to train you for a contest, you're going to get someone who has been on stage for years and coached dozens of others to the stage as well. We have that kind of experience level in a variety of different disciplines. Retired pro football players, wrestlers, track coaches, fighters, powerlifters, and the list goes on. I consider our whole membership a special service just because it's so different from 95 percent of our industry. Athletes can't train like they can train at our gym, but in a handful of locations in the country. Pre-contest preparation coaching is also something that's unique to our facility. A couple gyms in the area have a trainer or two who do a little contest prep work, but nothing like you're going to find here. With one of our contest prep coaches you'll get full-service diet, nutrition, supplementation, posing and presentation, show selection strategy, and business help. That's not a package a lot of places offer. Functional training is gaining momentum in the more commercial side of fitness, but not at the level we offer it. We have strength and conditioning coaches who are way ahead of the curve on this type of training, which has so much carryover into athletics. It far surpasses getting in shape and really helps athletes perform and be healthy. We have quite a few famous faces in and out on a pretty regular basis. As far as bodybuilders go, Steve Kuclo has been training here since we opened up in 2009. Branch Warren and Johnnie Jackson stop by on occasion. Jonathan Irizarry, 2011 collegiate champ, trains himself and clients here. Some of the other national level bodybuilders who train here are 2012 Teen Nationals champ Cody Montgomery, 2012 Junior USA champ Dan Newmire, 2012 Mr. Texas Tyrus Hughes, TJ Clark, Armon Adibi, Ransford Jackson, and Kevin Ofurum. Chulsey Graham, before he passed away two years ago, was another great national level bodybuilder who called Metroflex Plano home. Tawna Eubanks, a 2012 bikini Olympia competitor, is in the gym every day training hard. Jennifer Dawn is also a bikini Olympia competitor who frequently in the gym and patrolling the streets around the gym, where she works as a Plano police officer. Kelsie Burgin, 2012 Bikini USA champ, and Olympia Bikini competitor Shelsea Montes are also Metroflex Plano athletes and friends. Jennifer Baker, 2012 National Pro Card Winner and military veteran, is an exciting new pro to come out of Metroflex. Top powerlifter Henry Thomason and top strong man and rugby professional Bill Bingham are a couple of names from power sports whom we are happy to have working out with us regularly. We also have a great network of top names who come and visit us at least a couple times during the year to grab a workout and hang out while they are in Dallas: Rich Gaspari, Flex Lewis, Mark Anthony, Ben Pakulski, Roelly Winklaar, Amanda Latona, and Ali Rosen just to name a few! I don't like to say it's hard to operate this gym, because it's just so much damn fun! Lucky for me, I have an amazing team in place. We watch out for each other and keep each other accountable, and it makes for a great work place and in turn a better experience for members. Aja Brunner is my general manager and is a vital part to this gym. She handles operations, employees, event marketing and has a hand in just about anything else that Metroflex Plano does. Our sales manager Matt Shane is the newest addition to the team and has brought a lot of industry experience to the team. Justin Tunnell, Diego Diaz, and Manny Mollina are also vital parts to our staff. The whole group has great culture and chemistry. Metroflex founder Brian Dobson gave me a Bowie Knife as a gift a couple years ago and wrote on it from Proverbs 27:17: "Iron sharpens iron, just as one man sharpens another." That is a mentality we work by. What makes you competitive with the other gym chains? Train harder, with better equipment, in a motivating and knowledgeable environment, and you'll get better results, faster. Does your gym have any special charities you raise money for? Yes! Metroflex Plano raises money for the Muscular Dystrophy Association. We support the MDA with different fundraising events and by selling our "Flex for Muscular Dystrophy" T-shirts. We also attend MDA functions and build relationships with children and young adults with Muscular Dystrophy. Check out the fundraising Facebook page, and if you'd like to support us, please purchase a T-shirt off the Metroflex Plano website.